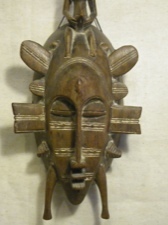 Handcarved wooden kpelie mask used in the initiation ceremony into the poro society, a religious society that all adult males belong. 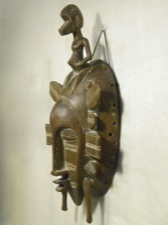 This style mask is known as the “the Beautiful Lady,” the refined face represents women, but is used in dances by men. 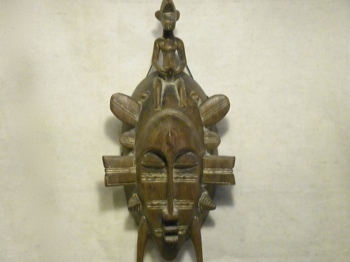 This mask is 14 inches long and 7 inches wide with beautifully grained and worn wood. 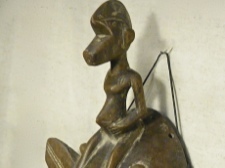 The Senufo of Ivory Coast are mostly farmers and skilled artisans. They revere several ancestor and bush spirits. The poro society is guided by a female ancestral spirit and its main function is to guide young men into being responsible members of the community.